This is the second part of my four part series on beer clarity. Last week we covered how to measure beer haze and some of the major causes of beer clarity issues. This week we’re going to go in-depth and discuss yeast, proteins and tannins and begin to cover how to control and improve beer clarity through ingredient selection. Yeast cells, at 5-10 microns in size, are certainly large enough to cause clarity issues in your beer, particularly younger beers. At the end of fermentation, most yeast cells will “flocculate” or fall out of solution and form a sediment at the bottom of your fermenter. However, it is not uncommon for a some cells to remain in solution and cause clarity issues for weeks or even months after bottling or kegging your beer. Different yeast strains “flocculate” or fall out at different rates. 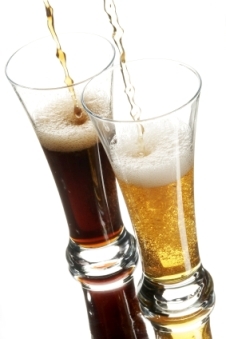 You can choose yeast strains that have a high flocculation rating, which will help your beer clear more quickly. Flocculation is aided by chilling your beer, which is why many commercial breweries will age and store their beer near freezing. Yeast is also removed using any of the finings we’ll discuss in part 3 – including polyclar, isinglass, gelatin, etc… so it is not difficult to aid flocculation. Yeast can also be removed easily by filtering your beer. Because yeast is relatively large, and can be removed using chilling, finings, and filtering, yeast is rarely the cause of long term clarity problems if you properly store and age your beer. It is most often an issue for young beers, and for commercial breweries who want to get the product out the door as quickly as possible. Proteins and polyphenols are at the center of most long term clarity issues in beer – both for home brewers and commercial brewers. Proteins, which naturally occur in malted barley and most adjunct grains as well, provide body and some flavor in beer, but also induce clarity issues. Polyphenols, also called tannins, come from both malt (primarily the husks) and hops, and are also present in all finished beers. They vary in size from 0.1 to 1 micron, making them smaller than most yeast cells. Unfortunately it is the combination of the two that cause chill haze and permanent haze in beer. Chill haze happens when a low molecular weight polyphenol interacts with a protein, often forming a weak hydrogen bond, to create visible particles in the beer. The particles will show when the beer is chilled, but will break as the beer is warmed, which is why the haze is only visible when chilled. The problem with chill haze is that these bonds are prone to polymerization, often aided by oxygen in the finished beer, which will turn the chill haze into a permanent haze. So you will want to minimize chill haze as well as oxygen if you want a stable clear beer in the long term. Improving the clarity of your beer starts with ingredient selection. Malts and adjucts both contain proteins, and you can select lower protein malts to control the proteins in your finished beers. The malt data sheets, available online from all of the major malt houses will list the protein content for a given malt, and if you are brewing a beer where clarity matters, selecting lower protein base and adjunct malts can really help. Some malts even come with a dehusked version which can reduce the tannins, as polyphenols/tannins primarily come from the husk of the grain. Also you may want to minimize high protein adjuncts like wheat or oats. As proteins do play a major role in providing both the body of the beer and also in foam retention, you don’t want to eliminate all of the proteins from a beer. Some protein is needed to provide mouthfeel as well as a proper head in the finished beer. Hops account for 20-30% of the polyphenols in your finished beer, which is why some very hoppy beers like IPAs also have clarity issues. Aroma (low alpha) hops do have slightly higher polyphenol content, so you could consider using higher alpha hops if you really want to minimize issues. However, the polyphenols from hops are generally less reactive so I personally select my hops based primarily on flavor considerations and not to minimize polyphenols. For very hoppy beers, I do recommend not “overhopping” your beer if clarity is a concern. While some brewers have gone to 1000+ IBUs in a beer, it is pretty well documented that beer has a maximum solubility for iso-alpha acids that tops out around 110 IBUs. In reality, the average person’s flavor threshold is well below even that level – with most people unable to distinguish bitterness much higher than about 70-80 IBUs. The problem with going well beyond that threshold is that you are adding polyphenols but not really contributing any perceivable flavor. That covers some basics on yeast, proteins and polyphenols – next week in part 3 I’ll continue with a discussion of additional clarity techniques as well as finings. I use 6 grams of Irish moss for a 50 litre IPA brew, which I chuck in with the last hops with 10 minutes boil to go. Now, don’t ask why I do it then, I just always have. I then filter out the cooled wort using a 200micron filter as I drain the beer out into my fermenter; I guess to help catch any of the seaweed still in the wort! Am I doing this all wrong, as I just read on here that finings should be added a week before bottling/kegging when main fermentation is about finished so that the residue yeast flocculates out. I do get very nice clear beer, so I am not looking to solve a problem, I am just wondering if anyone else does it when I do and/or if I am wasting my time/money mossing when I do?